The S3120 LCD Datalogger is used for recording temperature and humidity. With a built-in sensors capable of measuring from -30 to +80°C and 0 to 100% humidity. The S3120 is battery backed, with a battery life of up to 6 years. After a logging session, data can be transferred to a PC for further analysis via optional USB, RS232, GSM or Ethernet interface. All logger configuration is performed from a PC using the free software. The program allows control of all logger functions and viewing and printing of recorded data in numerical and simple graphic format. It is possible to export recorded values to dbf or txt formats for further analysis in spreadsheets like Excel. Logging can be started/stopped immediately, at a specific date/time and be using a signal applied to the digital input. Logging mode can be adjusted as cyclic and non-cyclic. In cyclic mode the oldest stored values are overwritten by new data. With non-cyclic, logging ceases when the memory becomes full. It is also possible set such that logging only occurs when the input signals exceed an alarm threshold. Stored values can be transferred from logger memory to the PC by means of an optional communication adapter. The optional communication adapter can be connected to the logger permanently – data logging is not interrupted even during data download. With the optional LP005 Ethernet Adaptor, data download can be performed over a LAN and alert emails and SNMP traps can be sent on alarm. With the optional GSM-Kit, data download can be made remotely over the GSM/GPRS mobile phone network as well as SMS interrogation and SMS alert texts. The free SWR001 software is designed for communication with data loggers, read out the configuration of the device and setting up the parameters. 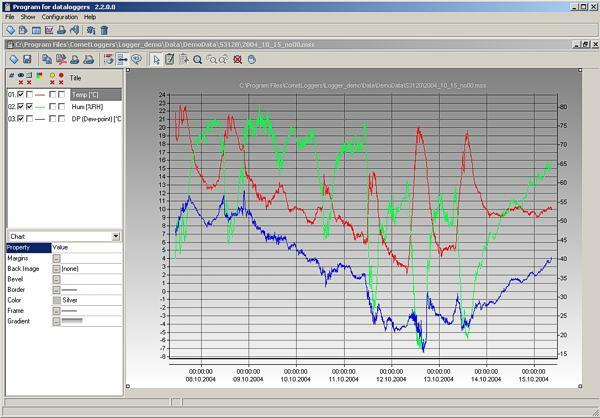 It also allows to read out the data from the device in order to get the measured values. For the temperature and humidity devices is possible to select one counted value (dew point temperature, absolute humidity, specific humidity, mixing ratio, specific enthalpy). Data can be viewed and printed as table or graph. It it also possible to export the data to DBF or TXT files. You can change the axis and select any time range to view or print out the data. It is allowed to zoom the graph, modify the drawing width and the its color. It is also possible to separate the quantities from each other and print some of them or all of them separately.